The field of protein engineering is booming. It represents a market that is projected to reach $168 billion by 2017. This projection comes from a report produced by MarketsandMarkets, which divides the protein engineering market into three application areas: biotherapeutics, diagnostics, and research. Relevant technologies cited in the report include sequence modification/glycosylation, pegylation, display technologies, humanization technologies, hybrid technologies, and transgenic mice. Similar issues were discussed at two recent conferences, CHI’s PepTalk (held in San Diego) and GTCbio’s Protein Discovery Summit (held in Boston). These events featured cutting-edge research and highlighted current challenges and evolving solutions in the field. Presentations included novel ways of utilizing mass spectrometry, new strategies to engineer and express proteins in yeast and baculovirus systems, how to better validate biosimilar drugs, and improved instrumentation to assess protein aggregation. The ability to characterize proteins from initial sequence to final conformation is critically important for delineating the safety and efficacy of protein drugs. 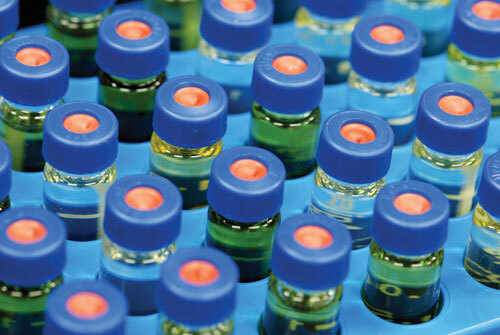 “Biological mass spectrometry (MS) provides a variety of approaches to study structural properties not only at the quality control step, but also throughout the process of discovery and design,” noted Igor A. Kaltashov, Ph.D., professor and graduate program director, department of chemistry, University of Massachusetts Amherst. According to Dr. Kaltashov, MS is enjoying dramatic growth in popularity as a tool for assessing conformation and dynamics of protein drugs. “Although one of the shortcomings of ESI-MS is that studies need to be done in solutions compatible with the overall process (often volatile electrolytes such as ammonium acetate or ammonium bicarbonate), there are other approaches. Many labile hydrogen atoms, however, do not readily undergo HDX. Some of these recalcitrant hydrogen atoms are involved in hydrogen bonding; others are sequestered in the protein interior. Still, they may be amenable to other approaches. As multibillion dollar blockbuster and other drugs come off patent, the scramble to produce biosimilars ensues. “Biosimilars are one of the fastest growing segments of the pharmaceutical industry today,” noted Paul Belcher, Ph.D., market development leader, GE Healthcare Life Sciences. To illustrate the high-throughput process development of a biosimilar molecule, Dr. Belcher cited the example of interferon alpha-2a. Comparability studies of this biosimilar relied on a molecular interaction analysis system, the Biacore™ T200, and a new, fully integrated Western blot platform, the Amersham™ WB. Purity is another key attribute in this process. For that, Dr. Belcher’s team employed the Amersham WB system. Transmembrane proteins play critical roles such as serving as transporters and receptors that transduce the binding of extracellular ligands into intracellular signals. They constitute 20–30% of the protein coding potential of most genomes. But, transmembrane proteins also present challenges for characterizing and analysis related to expression, solubilization, and purification, especially if derived from eukaryotes. “The difficulties encountered in working with transmembrane proteins constitute a significant barrier to fully understanding their mechanisms,” said Mark E. Dumont, Ph.D., professor of biochemistry and biophysics, University of Rochester Medical Center. Dr. Dumont’s laboratory focuses on eukaryotic transmembrane proteins and employs baker’s yeast systems for expression. “Many crystallographers prefer to express proteins in bacteria,” noted Dr. Dumont. “For transmembrane proteins, however, this approach is often unsuccessful for reasons that are not well understood. As an example, Dr. Dumont’s team, working with collaborators in the laboratories of Michael Wiener, Ph.D., from the University of Virginia, and Michael Malkowski, Ph.D., from the Hauptman Woodward Medical Research Institute, in Buffalo, solved the three-dimensional crystal structure of Ste24p, an integral membrane protein—more particularly, a CAAX protease. Ste24p is a homolog of the human zinc metalloprotease ZMPSTE24. These proteases are critically involved in the post-translational maturation of the yeast mating pheromone a-factor and human lamin A, respectively. Mutations that affect proteolytic cleavage by ZMPSTE24 in humans lead to premature aging disorders in children, such as Hutchinson–Guilford Progeria Syndrome. Many proteins considered important by pharmaceutical companies are prenylated in vivo. This type of post-translational modification adds lipid-like, hydrophobic molecules to the carboxyl terminus to facilitate attachment to cell membranes. What’s straightforward for Mother Nature has proven a challenge to replicate in some artificially produced systems. “Expression and isolation of homogenous recombinant proteins can be very difficult because of the heterogeneous nature of post-translational processing,” said William K. Gillette, Ph.D., senior scientist, Cancer Research Technology Program, Frederick National Laboratory for Cancer Research. The group will now work to optimize the system and enhance efficiency. According to Dr. Gillette, such yield and purity from a baculoviral system is new to the field. Regardless of which system is utilized to express proteins, one key issue in the final product is aggregation. The significant presence of different forms of aggregates may influence not only quality, but also immunogenicity, adversely affecting patients. One strategy is the company’s focused beam, light extinction/light scattering technology. According to Dr. Nicoli, this technology—single particle optical sizing (SPOS)—provides high sensitivity and the highest (single-particle) resolution for detecting the concentration and size distribution of aggregates of proteins and other macromolecules over a very large size range. Initially, the technology presented a signal disadvantage: the need to dilute, often extensively, the starting sample. This difficulty, however, was lessened by subsequent development. “We introduced a radical change in SPOS technology by developing a focused laser beam sensor, first based on focused extinction (FX) and then based on focused scattering (FX-Nano),” pointed out Dr. Nicoli. “This focused-beam approach helps solve two problems. For the future, the company plans to continue refining and optimizing instrumentation to drive particle aggregate detection to even lower size levels and higher concentrations. 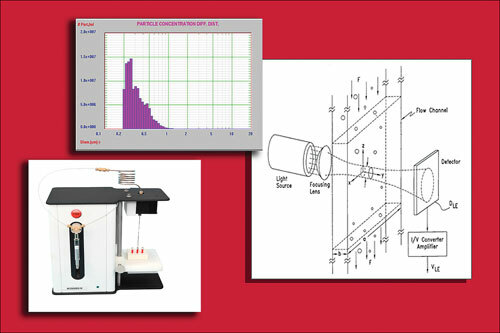 The AccuSizer FX Nano SIS system from Particle Sizing Systems is specifically designed to measure protein aggregation. The system consists of the SIS sampler, modified to be able to accurately deliver sample volumes as small as 250 µL, and two sensors, the LE400 and FX Nano sensors. These sensors can quantify the amount and size of protein aggregates from 0.15 to 200 microns.